Imagine the following scenario: you’ve configured a Phase 2 DMVPN network with a hub and a few spokes. DMVPN is configured properly, IPSec and NHRP are working, you can ping all around the DMVPN cloud. Next step: configuring EIGRP. You know you have to disable EIGRP split horizon and EIGRP next-hop processing. You even remember to configure interface bandwidth. Someone told you to minimize the EIGRP routing traffic, so you use EIGRP stub routers on the spokes and route summarization on the hub router. The final EIGRP configuration is shown in the following diagram (click to enlarge). Note: Your network is using 10.0.0.0/8 addresses for LAN links and loopbacks and 192.168.0.0/16 for WAN links. Would your Phase 2 DMVPN network perform as expected? If not, what’s wrong with it? If you think it has a problem, what would you change? This is just one of the scenarios covered in the DMVPN: from Basics to Scalability webinar (register here). We’ll also discuss OSPF, BGP, RIP and ODR routing as well as highly-scalable solutions like unidirectional routing and hierarchical hubs in Phase 3 DMVPN. Update: You might want to read the solution. Next, for the thoughts I have. Summarizing routes with EIGRP in Phase 2 deployments does not significantly improve scalability if the spokes support EIGRP stub feature. Indeed, the main problem with EIGRP scalability is query scoping, which is effectively implemented using the stub feature. Being distance-vector, EIGRP is not very sensitive to topology change events in hub & spoke networks - incremental updates handle this smoothly. 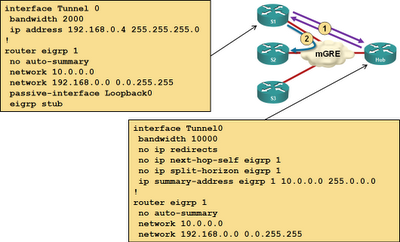 Unlike link-state protocols, EIGRP routing for Phase 2 may handle large hub and spoke topologies better. Of course, for large deployments, BGP could be a better option anyways. Hello. What would be the problem with having the spokes summarize their networks in phase 2? Won't the hubs re-advertise this summary to the rest of the spokes? Auto-summarization could generate all sorts of interesting side effects, so I disable it by default. Other than that, using summarization on spokes is fine - you shall not use it on the hub router (Phase 2 DMVPN only).